("Quaoar," 2002 LM60, is one of the largest known EKOs -- more). 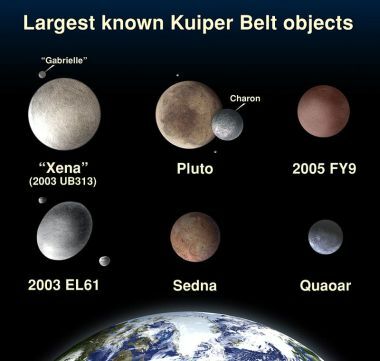 In an article published on July 22, 2013, astronomers studying Quaoar revealed that the object may be larger than previously estimated with an equatorial diameter of 1,138 +24/-17 kilometers (707 +15/-11 miles) but also be too out of round to be classified as a dwarf planet by the IAU. Based on a single occultation of a background star on October 15, 2012, they determined that Quaoar may be more like an ellipsoid (with a true oblateness of 0.087 +0.0268/-0.0175, assuming a Maclaurin spheroid with an indeterminate polar aspect angle) and have a density of 1.99 grams per cubic centimeter. While an atmosphere of nitrogen or carbon monoxide was ruled out, Quaoar may have an atmosphere of methane (Victoria Jaggard, New Scientist, July 26, 2013; and Braga-Ribas et al, 2013). On October 7, 2002, astronomers Chad Trujillo and Mike Brown announced the discovery of one of the largest planet-like objects since Pluto was found in 1930. Identified as a new object on June 4, 2002, it was actually imaged as early as 1982 by astronomer Charles T. Kowal. Provisionally designated as 2002 LM60, the IAU eventually accepted the discovery team's nomination of "Quaoar" (the great force of nature that summoned all other things into being for the Tongva people who inhabited the Los Angeles area of the United States before the arrival of the Spanish and other European settlers) as a permanent name. On August 24, 2006, the International Astronomical Union (IAU) voted to establish a new category of Solar System objects called "dwarf planets." 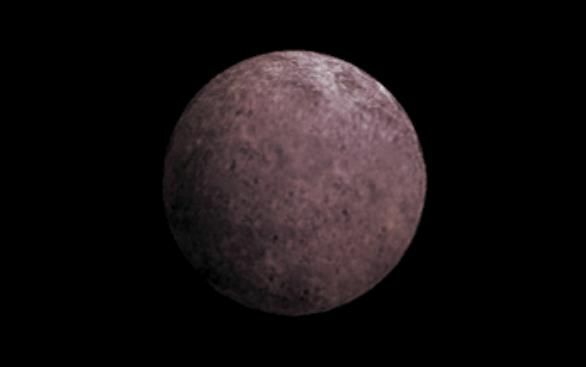 Quaoar (2002 LM60) is large enough to have a spherical shape and so is a candidate for IAU designation as a dwarf planet. 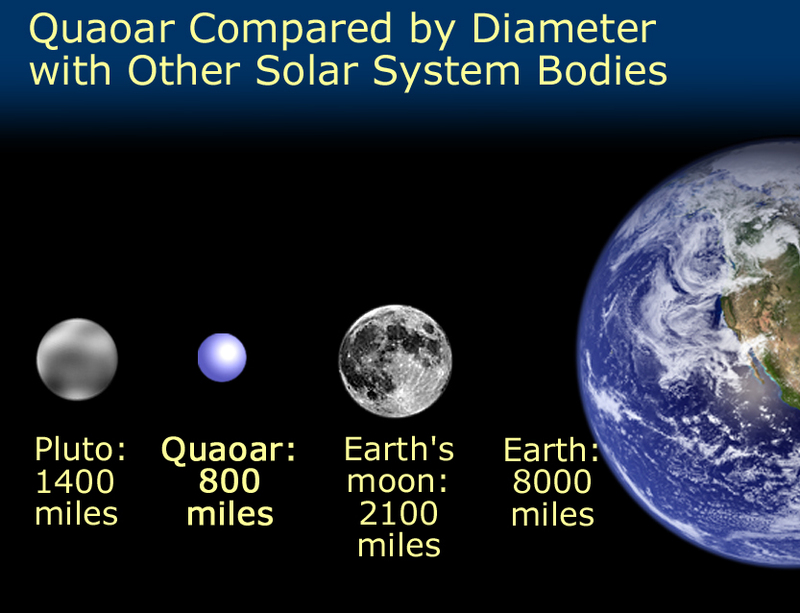 (Quaoar is more than half as wide as Pluto, the second largest known EKO -- more). 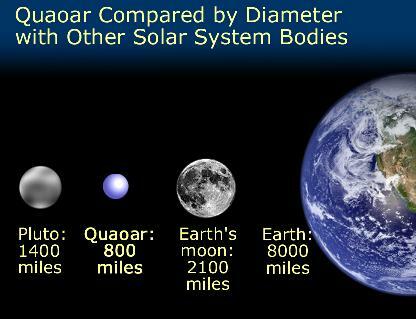 About 780 miles (1,250 km) in diameter, Quaoar has about one-tenth the diameter of Earth and more than half that of Pluto's, but is larger than Pluto's moon, Charon. As expected, Quaoar spins on its axis, but more visual data would have to be collected with the Hubble Space Telescope to determine its rate of spin. Located at an average orbital distance of about 43 AUs from the Sun, it moves in a roughly circular orbit (e~ 0.037) that is inclined by about 7.9� to the plane of the ecliptic and takes around 288 years to complete (more discussion of orbit in CalTech press release). similarly red and icy (more). On June 11, 2008, the International Astronomical Union (IAU) voted at the meeting of its Executive Committee to establish bright "dwarf planets beyond the orbit of Neptune as a new class of substellar objects in the Solar System called "plutoids" (IAU press release). According to the IAU, these plutoids "are celestial bodies in orbit around the Sun at a distance greater than that of Neptune that have sufficient mass for their self-gravity to overcome rigid body forces so that they assume a hydrostatic equilibrium (near-spherical) shape, and that have not cleared the neighbourhood around their orbit. Satellites of plutoids are not plutoids themselves, even if they are massive enough that their shape is dictated by self-gravity. 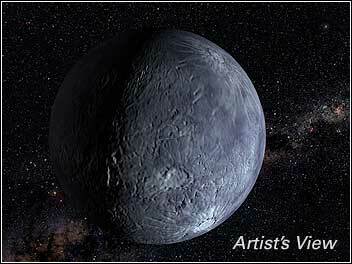 The two known and named plutoids are Pluto and Eris [formerly 2003 UB313]." In addition, "it was decided that, for naming purposes, any Solar System body having (a) a semimajor axis greater than that of Neptune, and (b) an absolute magnitude brighter than H = +1 (magnitude will, for the purpose of naming, be considered to be a plutoid," so that many large and relatively round Edgeworth-Kuiper ice bodies may eventually be designated as plutoids, including Quaoar. In a pre-print uploaded on March 20, 2010, astronomers Wesley Fraser and Michael Brown submitted a paper on their study of archival Hubble Space Telescope images involving Quaoar and its moon Weywot. This information allowed the astronomers to calculate Quaoar's mass and derive its density. Quaoar is now estimated to be around 890 � 70 kilometers (km) -- or 553 � 43 miles -- in diameter and to have a density of around 4.1 � 1.3 grams per cubic centimeter. This high density indicates that the planetary object is composed primarily of rock, more like an inner-orbit asteroid, than the mostly volatile ices that outer orbit, Edgeworth-Kuiper Belt objects (EKO) like Pluto appear to be composed of. The astronomers speculate that Quaoar may be either an asteroid that got perturbed into an outer orbit or an EKO that lost its mantle of volatile ices after collision with another proto-planetary body (Fraser and Brown, 2010; and David Shiga, New Scientist, April 7, 2010). 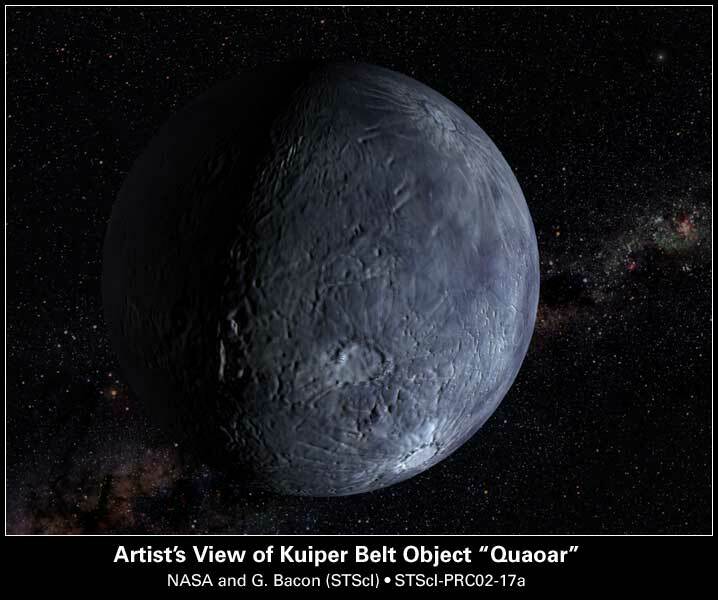 According to astronomer Mike Brown's blog entry for December 31, 2007, Quaoar has a tiny moon. The satellite appears to be a remnant of an ancient collision with another large planetary body, much as the Earth's Moon is a remnant of a collision between a Mars-sized object and the Earth around 4.5 billion years ago. Brown hypothesizes that this giant collision should have removed most of the ice inside of Quaoar so that its interior should be much more rock than ice, as may be the case for many other large bodies recently found beyond the orbit of Neptune. It has been named Weywot, after the sky god of the Tongva people, who was also the son and first creation of the creator god Quaoar (more)). Hubble images have been used to analyze the motion of its moon, Weywot, which enabled calculation of Quaoar's mass and derivation of its unusually high density. Since Quaoar has been found to be heavy and rock-like, its moon is pulled along more quickly than if Quaoar has more ice and is lighter. It appears to have an elliptical orbit with an eccentricity of 0.14 � 0.04, a period of 12.438 � 0.005 days, and a semi-major axis of 1.45 � 0.08 � 104 km (Fraser and Brown, 2010). Astronomer Chad Trujillo's discovery team maintains a Quaoar FAQ page. © 2002-2013 Sol Company. All Rights Reserved.